The Luck of the Irish is a book with a collection of blessings and quotes along with toasts and songs about Ireland. This Irish book features bits of wisdom about the Emerald Isle and her people. The Luck of the Irish pocket book has 80 pages of quotes and blessings along with full color illustrations. The hardcover Irish book includes a 24K gold plated shamrock charm that is attached to the ribbon bookmark; the book measures 3 1/4" wide x 4" tall. 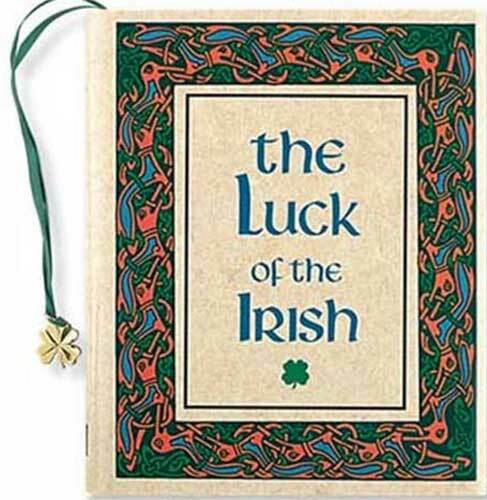 This Irish blessing book is received with a shamrock history card, complements of The Irish Gift House.